Events - Naoki Takyo - Freelance photographer currently based in Lebanon. 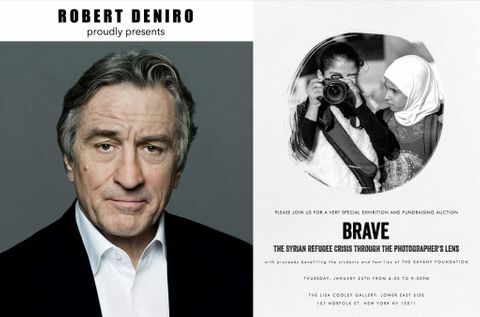 Robert De Niro presents the photo exhibition and auction - Brave: The Syrian Refugee Crisis through the Photographer's Lens) (Web link here). Photographs taken by Naoki Takyo, fellow photographers and Syrian refugee students who participated in their photography workshops in last autumn will be exhibited and auctioned in New York City. Venue: Lisa Cooley gallery, Time: 6-9 pm, Thu, January 25, 2018. Free admission. Since the outbreak of war in 2011, almost half of the Syrian population has been uprooted by the conflict, forced to leave their homes. Nearly two million fled to Lebanon. There, the Syrian people—children, families, teachers, doctors, the elderly, the sick, men and women of all kinds—have tried to rebuild their lives amid a senseless war, the disorientation of life as refugees, and the uncertainty of their futures. These millions have names, they have faces, they have fears, they have dreams. BRAVE: The Syrian Refugee Crisis through the Photographer’s Lens is an exhibition organized by The Brave Project on behalf of the Kayany Foundation in order to share with the world the experience of life as a Syrian refugee. The exhibition features photographs both of and by the students who attend the schools that Kayany operates, and the children and families who live in the informal refugee camps that have formed in eastern Lebanon. The exhibition is open to the public and free of charge (though a suggested donation is appreciated). On Thursday, January 25th, from 6-9pm, please join us for an evening event and auction where guests can bid to take home these beautiful, unique, and revealing photographs. Proceeds from the event will go toward the Kayany Foundation’s programs to ensure they can continue to provide education to Syrian children living as refugees in Lebanon. The Host Committee includes actress Vanessa Redgrave and Peter Brown, the former manager of the Beatles. Syrian activist George Batah will speak, offering his firsthand experiences of having to leave home because of the conflict. Music will be provided by renowned oud player Murat Keyder, and Syrian and Lebanese mezze, snacks, and drinks will be served courtesy of Brooklyn's Dar 525 Restaurant. The exhibit will feature the work of photographers Naoki Takyo, Tarek Haddad, and Juan Sanchez, as well as the Kayany students, ages 8-14, who took part in photography workshops with them this past fall. The exhibition will take place at the Lisa Cooley Gallery, 107 Norfolk Street, New York, NY 10002. (The Gallery is at the corner of Norfolk and Delancey Streets, just steps from the F, M, J, and Z trains at Delancey-Essex Street station). Please RSVP or contact info@thebraveproject.org with any questions or for more info. Thank you--we hope to see you there!